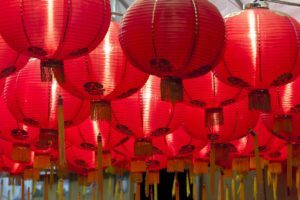 The term Dai is used by the Chinese government to group in several minorities that have similar religious beliefs and dialects. There are seven documented different dialects for the Dai, based around where they lived. The rugged terrain of Yunnan made it hard, even now, to connect the various villages in the province so different dialects and beliefs developed based around whether you lived in the valley near the river or in the mountains. What stays similar throughout the region was their belief in Buddism, which is reflected in the vast number of temples through out Yunnan and the celebrated holidays. The Dai dress colorfully, mirroring the colors in the temples. They also have unique poetry, song and dance that is sometimes on display for the local tourists. Their cuisine cares a wide variety of flavors, most notably spicy and bitter. Bamboo shoots are routinely included with meals, as well as pickled vegetables along with rice and meat. Many westerners would consider the cuisine to be simple, but its key is freshness. You can generally identify everything on the plate. Even the fish out the river are always served whole and where most likely caught that morning. Yunnan is home to wide variety of insects that are actually eaten as a local delicacy. You can find fried and spiced wasp larva, grasshoppers, cicadas, and chestnut bugs at the local restaurants and dinner tables. Home of the Dai people of Yunnan, China with ancient tea trees for which small batch puerh is produced. The tea is not scented in this region, it is valued for its size and vegetal flavor. The larger the leaf, the better in the eyes of the Dai. 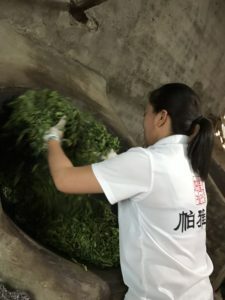 The tea plants are grown both trimmed and untrimmed. A tea plant over 100 years old is allowed to grow wild, and is plucked using a ladder. These ancient trees are treated with the utmost care, with many of them being well over 300 years old. Fertilizer comes from the local cows and chickens. Pesticides are not used because those insects in the tea plants may well become a side dish at dinner. These ancient tea trees are a piece of history that the Dai consider as a gift given to them to share with others. 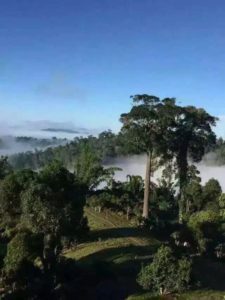 So the next time you enjoy a cup of Puerh or Yunnan Sunrise, think of the Dai and the care they put into these trees and your favorite cup of tea. Are you a lover of Darjeeling tea? Or perhaps just curious about the region? Unfortunately, it appears that the struggle for recognition by the Ghorkha has led to the harvest of a tiny fraction of the expected tea crop in Darjeeling. In fact, indications are that Darjeeling tea on auction in Kolkata is way way down and trending toward zero with upcoming auctions. The relatively short, yet ultimately complex history of the region set the stage for a months long uprising triggered by a ruling about language taught in schools. If you haven’t taken a close look at a map of India and West Bengal recently, now is a great time to do so. West Bengal is an oddly shaped state in Eastern India. Almost serpent like in shape, West Bengal extends from the Bay of Bengal in the south up to the high mountains between Nepal and Bhutan. It then extends east, sandwiched between Bhutan and Bangladesh. India extends further to the east into Assam where the country opens up, yet Darjeeling itself is seemingly squished from all sides with a greater geographic touch to neighboring countries than to India. Darjeeling, once part of Nepal, was ceded to the British and East India Company in 1815 in the Treaty of Sugauli. Modern India was created in 1947 when it became independent from Great Britain. It’s only 70 years old! Bengal was separated along religious lines into West Bengal (India) and East Bengal (Pakistan) during Indian independence. Bangladesh, formerly East Bengal, succeeded from Pakistan in 1971. The Ghorkha are Indian citizens of Nepali descent. They speak a different language and have different customs from those to the south, the majority Bengali Indian population. They have been advocating since 1907 – 40 years before India’s independence – for recognition and their own independent state. The desire for more autonomy, and recognition as different from Bengali’s of the south, has contributed to significant friction that has occasionally spilled over to violence since that time. This desire for its own state led to the creation of the push for Ghorkhaland to include the northern most portions of West Bengal – a region from Darjeeling east to the border with Assam. Within the Gorkhaland region you will find that the population actually includes Nepali (which is actually 15 different ethnic groups), Lepcha (some of the earliest settlers), Bhutia (people migrating from Bhutan, Sikkim and Tibet), Tibetan (refugees from Tibet during the Sino-Indian War of 1961), Bengali (settlers and migrants from South Bengal and refugees from Bangladesh), and many others not otherwise classified1. During the past 100+ year desire for recognition and its own state, the Gorkha have come together and formed various political parties and violence has flared from time to time, notably in the 1980’s and again in 2013. This has led to various concessions from West Bengal with the current major political party, the Gorkha Janmukti Morcha (GJM) advocating for recognition and the Gorkha Territorial Administration, providing semi-autonomous self-governing in the region. In May 2017, the West Bengal government of Chief Minister Mamta Banerjee issued a ruling that Bengali must be taught in all schools in West Bengal through the 10th grade. In a region that has struggled for over 100 years for recognition, in an area more closely aligned to Nepal than to Bengal, this was the spark needed to revive the push for an independent Gorkhaland state. Immediately after the announcement from the West Bengal government the GJM and other related parties renewed the long simmering push for an independent state with Darjeeling as the epicenter for protests. On June 12th, the GJM called for an indefinite bandh – a Hindi word for general strike – while at the same time a group of 26 trade unions lent support by calling for a strike by tea workers as well. Many people in the region took to the street to protest causing disruptions in local government services and transportation, making it difficult for tourists and residents of boarding schools of the region to leave. In response, the West Bengal government sent in police and military to try and quell the unrest. To date at least three people have died and multiple buildings and vehicles have been burned. As August 2017 approaches the region continues to protest with tea production and tourism, two of the largest industries of Darjeeling and the greater Gorkhaland area, mostly at a standstill. The GJM has refused talks with the West Bengal Government, instead pushing for talks at a national level to push for the creation of their state. And, if the West Bengal Government is to be believed the GJM may now be bringing in outside help to train protesters for a long drawn out struggle2. The season for 2nd Flush Darjeeling is now past, the ruling Bharatiya Janata Party (BJP) of Narendra Modi thus far has not engaged in the discussion for a Gorkhaland state, and the GJM remains unwilling to work with the West Bengal Government. So the 2017 Darjeeling crop is a bust and early indications aren’t looking good for a resolution anytime soon potentially threatening the 2018 Darjeeling crop as well. With the Ceylon tea industry celebrating 150 years this week, we thought we would highlight five interesting facts about Ceylon tea and the island of Sri Lanka. Coffee was originally planted by the British as the crop that would be used, via export, to pay for this strategic military outpost. Luckily, tea seeds and plants where brought onto the island in the 1840’s for testing by the local botanical garden as an additional crop that could be exported from the island. It wasn’t until 1867 that the first tea plantation went into production, which was fortunate. In the 1870’s, rust would wipe out the coffee plantations in Sri Lanka, at which point the coffee growers ripped out the coffee plantations and replaced them with tea. 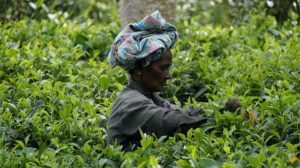 Without this rust outbreak, Ceylon tea may never had taken off. First batch of tea grown in Ceylon arrived in England in 1872. 1 million packets of Ceylon tea were sold at the World’s Fair in Chicago in 1893. Ceylon tea is typically black tea and can come as both a single estate tea, like Vithanakanda, or a mix of small farms that share a manufacturing facility as in our Ceylon OP1. Periodically you can find a green tea from the island that stands up to the greens from China, like Royal Ceylon Gunpowder. As an American, you have probably had Ceylon tea even if you were not aware of it. Ceylon tea is judged for its malty flavor with a brisk finish that is toward the back of your mouth. Cream tea refers to practice of having tea with scones and clotted cream. A truly British practice coming out of the afternoon teas, or high teas, made popular by the Duchess of Bedford in the early 1800’s. The practice of afternoon tea became extremely popular by the mid-1800’s, even spreading to the United States. Afternoon tea became popular at the same time that the railroad expanded in London. Londoners would get on the train and spend the weekend along the southern coast of England. 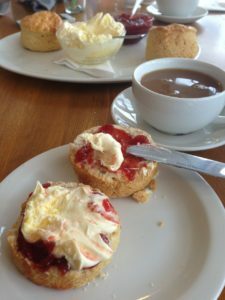 It was in the West Country of England (actually the southwest part of England along the British Channel), which encompasses Devon, Cornwall, Dorset, Somerset, that brought the term of cream tea into the British lexicon. The local restaurants and pubs, in catering to the weekend tourists turned afternoon tea into cream tea. This area of England was and still is well known for their lamb, beef and cheese production. Their use of local ingredients for the food at the afternoon teas created huge demand, especially for the clotted cream, which is best described as whipped cream meets butter. Keeping in mind that refrigeration had not come along yet, clotted cream would have been a true treat. It does not keep for more than a few days, even in modern refrigeration. So if you can imagine having something like frosting, without the sugar, on top of your scone in a time where nothing like that existed you can understand why it came to be called cream tea. And they always added jam to give it sweetness. Welcome to where the 3-4 pm sugar and caffeine fix came from in European and American culture! Cream tea is still alive and well in the West Country of England. There are even debates on whose clotted cream is better, Devon or Cornwall. So if you should ever find yourself on the southern coast of England, stop into the tea shops and enjoy the original clotted cream. If you want to make your own, here is a recipe that doesn’t require the use of the stove top.